For smartphones, the Rs 20,000-Rs 30,000 range is significantly under-served and untapped. Most mid-range aim for the sweet spot of Rs 15,000 but with distinct compromises, while the high-end offerings breach the 30k barrier by a significant margin. In between are the premium mid-range smartphones which while sporting a mid-tier processor up the ante by offering a more enticing set of features. A mid-range phone buyer is mostly maxing out his value for money, but ones who have an eye for aesthetics wouldn’t mind paying a bit more. That’s the audience HMD Global is playing at. Being a relatively small force that rose from the ashes of Nokia last year, the Finland-based company is hard at work trying to restore the iconic brand to its earlier glory. The Nokia 7 Plus, which released in India last month is the company’s latest offering. The shiny copper-lined exterior is tough, housing the in-vogue 18:9 display, while the phone itself is fast and nimble with a powerful mid-range processor. The phone joins last year’s Xiaomi Mi A1 under the Android One Program which promises regular updates and clean, stock UI. Nokia also renewed its partnership with Carl-Zeiss with the 7 Plus and the dual cameras at the back of the phone is born out of that. All that make the Nokia 7 Plus the flag-bearer of HMD Global’s mission to gain back the market for Nokia phones. The set of features surely seems to make the Nokia 7 Plus a phone to rely on, but are they enough to justify a Rs 25,999 price tag? We find out. 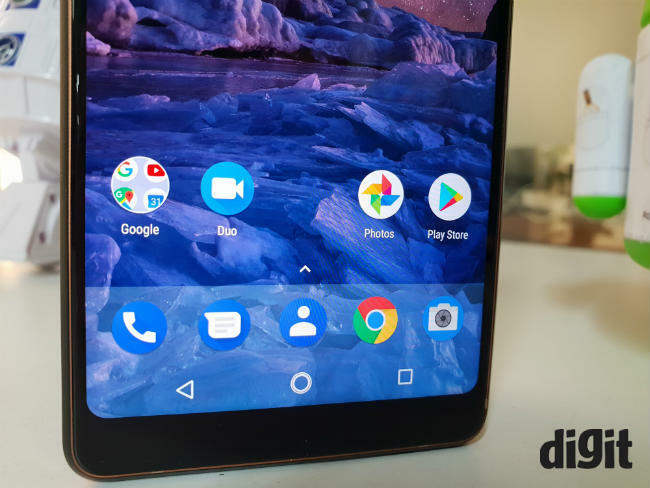 The Nokia 7 Plus stands out both from the crop of Android smartphones that launched this year and from HMD Global’s own lineup of phones, primarily for the 18:9 display and the premium build-quality it touts. While the display is now quite common across all segments, the attention HMD has paid in making the body sets itself apart from the competition. The phone is carved out of single block of aluminium with rounded corners and HMD has given the back a ceramic-like finish that is smooth, but at the same time, not slippery. It also feels quite premium. All along the edge runs a shiny, thick copper band. 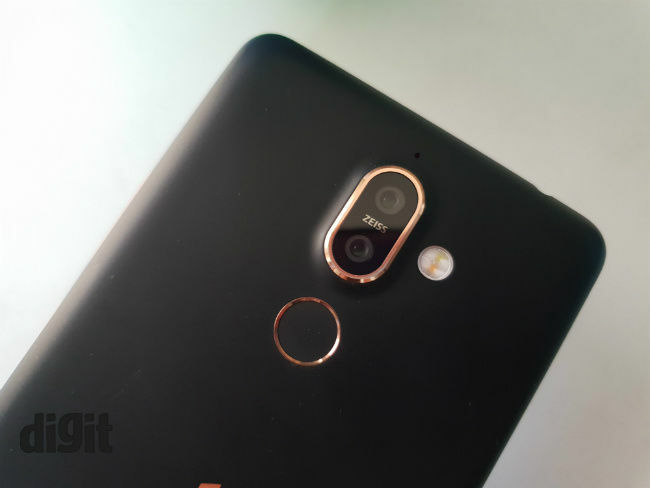 The copper accents are present around the fingerprint sensor and the dual cameras, both of which are placed centrally at the back. The copper accents may not be everyone’s cup of tea, but I quite liked it. Nokia was known for its pioneering design back in its hay day and it’s good to see the company sticking to the old values. I particularly liked the way Nokia has handled the camera bump on the phone. The camera doesn’t jut out of the body like every other phone. Instead, it’s gently sloped with an uninterrupted flow that simply looks great. The Nokia 7 Plus is quite bulky as well thanks to a 3,800mAh battery. But the added heft helps with the grip. While it is by no means slim, the rounded edges makes the phone rest snugly in the palms, although the copper edges are somewhat sharp and tend to dig into the hand a bit. The highlight of the phone is, of course, the display. The 7 Plus does sport the taller univisium display but it’s not a bezel-less phone. There’s some space at the top and the bottom while the sides have a thin border around it. 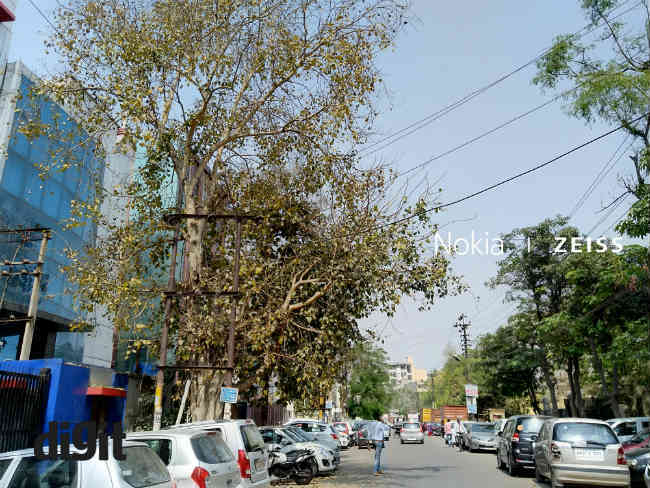 The top houses the Nokia moniker at the right corner and the front camera beside it. The copper band around the edges is interrupted first by the 3.5mm headphone jack at the top and then by the USB-Type C port, the mono speaker and the microphone at the bottom. The volume rockers and the power button are nicely flushed in with the copper banding, which improves the overall aesthetics of the phone. As I stated before, the charm of the Nokia 7 Plus rides on the 18:9 display. It’s the first Nokia phone to adopt the new display format, but there’s already a horde of phones rocking the same form factor. The 6-inch IPS LCD panel on this phone is one of the better ones at the price range though. It’s bright enough to be legible under direct sunlight and the colours are vibrant and pop out when watching a high-definition video. There’s Corning Gorilla Glass 3 on top for protection, which is strange for a phone at this price when Gorilla Glass 5 is already being used in phones. The viewing angles of the display are wide and while not scientifically measured, this looks like one of the more colour accurate displays at this price range. What’s missing is an ambient always-on display option that has become the standard in high-end mid-range phones. There’s also no way to tweak the colour temperature and hues. The phone does offer a ‘night-mode’ that puts an orange tint to keep the eyes safe from screen glare at night. Last year’s lineup of Nokia devices received a lot of criticism for being underpowered for the price they were offered at. HMD seems to have listened to the feedback and packed its latest devices with hardware that is at par with the competition. In fact, the hardware in the Nokia 7 Plus pushes the boundaries of a mid-range phone even further. It is powered by the Qualcomm Snapdragon 660 chipset, the first of its kind in India. Overseas, the same SoC powers the Vivo X21 UD and the Oppo R15, both flagship-grade phones that have recently launched in China. 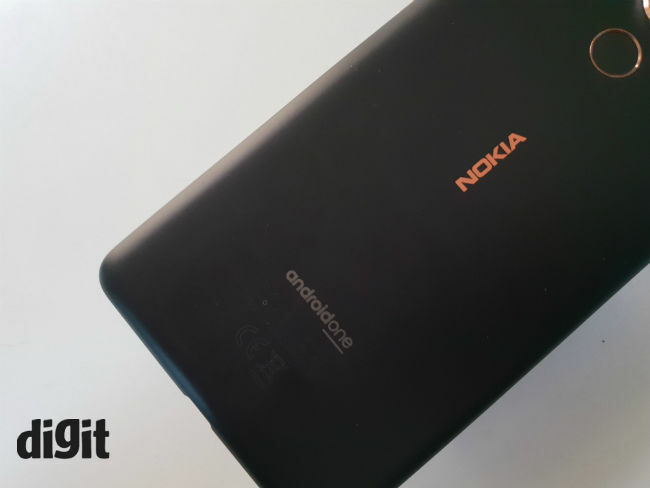 The choice of chipset itself puts the Nokia 7 Plus right back into the competition and somewhat justifies the higher asking price. The chipset is coupled with 4GB of RAM and 64GB of storage which can be upgradable via a microSD card. The 7 Plus comes with a hybrid SIM slot with the option of either expanding the storage or use a second SIM card. The Snapdragon 660 falls under the mid-range category of Qualcomm chipset but it rocks the same custom Kryo cores found in the flagship 8-series chipsets. 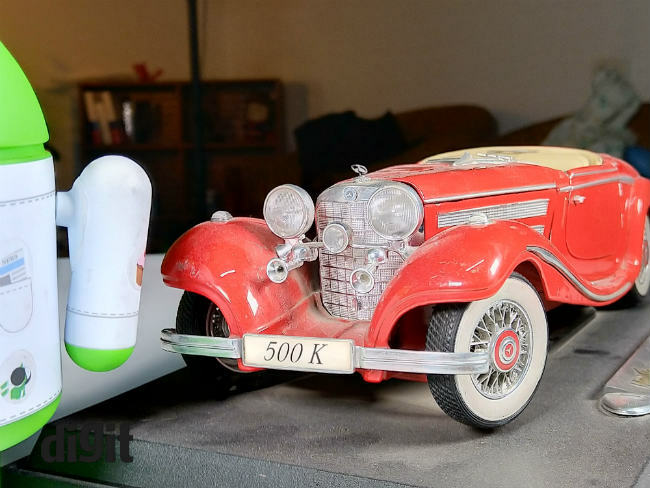 Apart from the custom cores, there are other flagship features as well, making the SD660 the most powerful 6-series chipset by Qualcomm so far. It is based on the 14nm FinFET architecture with four efficiency cores clocked at 1.8GHz and four performance cores clocked at 2.2GHz. The processor is backed by an Adreno 512 GPU. The Snapdragon 660 is the successor to the Snapdragon 653 that powered phones like the Oppo F3 and the Samsung C9 Pro last year. Qualcomm promises a performance boost of 20 percent which is pretty much what we saw in our benchmark results as well. In AnTuTu 7.0, the phone scored a high 136351 which is double than what the Oppo F3 got which is in line with what Qualcomm claimed. On 3D Mark, the phone scored a 2040 which is higher than any other mid-range phone right now. Raw performance aside, what really sets things blazing in the Nokia 7 Plus is the choice of pure, vanilla Android. 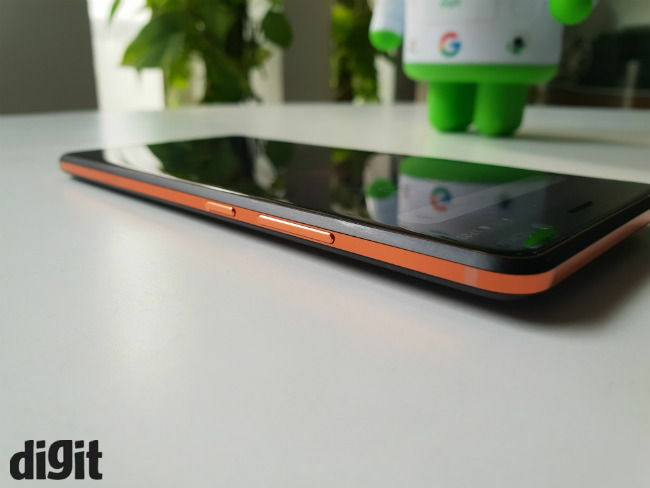 The phone is under the Android One Program which Google uses to showcase the best of Android. 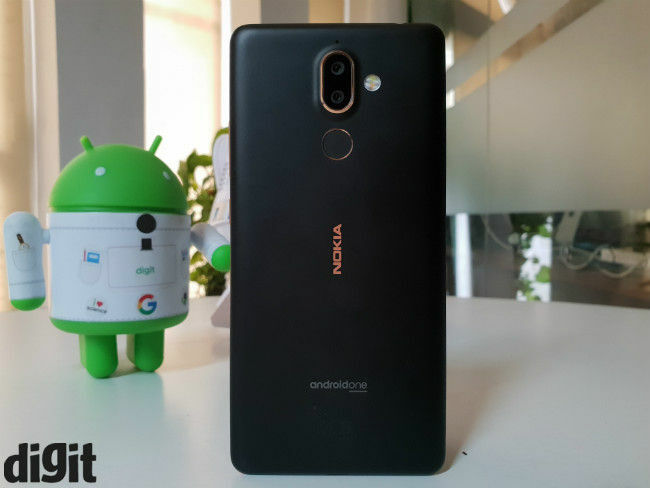 Android One also means that the Nokia 7 Plus will receive monthly security updates regularly as well as the next two OS version upgrades. The Nokia 7 Plus launched with Android 8.0 Oreo out of the box with the option to update to Android 8.1 right after turning it on. There’s absolutely no bloatware in the phone and most of the storage is left unused. The same cannot be said for the RAM usage though. Using the phone as a daily driver, I often found the phone having just around 1GB of free RAM. It is just about enough to prevent to phone from slowing down, but a little stress and it will expectedly start to stutter a bit. The choice of clean, stock UI also means the learning curve is not that steep. Regular Android users will feel right at home. Ease of use has always been a highlight of Nokia phones and it’s good to see HMD maintaining the legacy. The Nokia 7 Plus is not just the first HMD device to sport the 18:9 display, it is also the first to rock Carl-Zeiss dual cameras at the back. First, the basics. The Nokia 7 Plus features twin wide angle + telephoto 12-megapixel sensors at the back. The primary 12MP sensor has an f/1.75 aperture and 1.4um large pixels while the secondary sensor has f/2.2 aperture and 1.0um pixel size. Incidentally, the Nokia 7 Plus has the IMX 362 sensor inside which is also used for the camera of the Google Pixel 2 and the HTC U11+. Furthermore, the camera has dual-pixel phase-detection autofocus like the flagship Samsung Galaxy phones, EIS and 2X optical zoom. The camera also supports Nokia’s OZO audio which is the company’s spatial audio technology that promises better sound recording while taking videos. There’s no OIS though which could have made the low-light photos easier to capture. After all, it was Nokia who first introduced OIS in phones. All this converts into a camera performance that is quite commendable, considering this is only the second phase of HMD’s offering. While taking photos, I found that the camera can lock focus quickly. Nokia has also brought back its famous Pro Camera App that used to be there in the Lumia phones. The app is quite intuitive with every feature easily accessible. Daytime shots with the Nokia 7 Plus are decent to say the least. They are well exposed with good details. The dynamic range isn’t adequate though and some details are lost in the shadows. The camera is also quite responsive and there’s not much lag in processing. The same cannot be said for low-light shots though. The 7 Plus does take commendable low-light photos provided you have the patience and a steady hand. The phone drops the shutter speed to capture more light which means a little movement leads to blurry shots. If you manage to take a steady shot though, the details are surprisingly good. There’s also relatively lesser noise in the low-light photos, but the dynamic range again left me asking for more. Having said that, the Nokia 7 Plus has surprisingly good low-light capabilities despite being a mid-range device. Closeup shots are detail-rich and sharp. The camera can focus on an object quite fast and the resulting shots have commendable background separation. 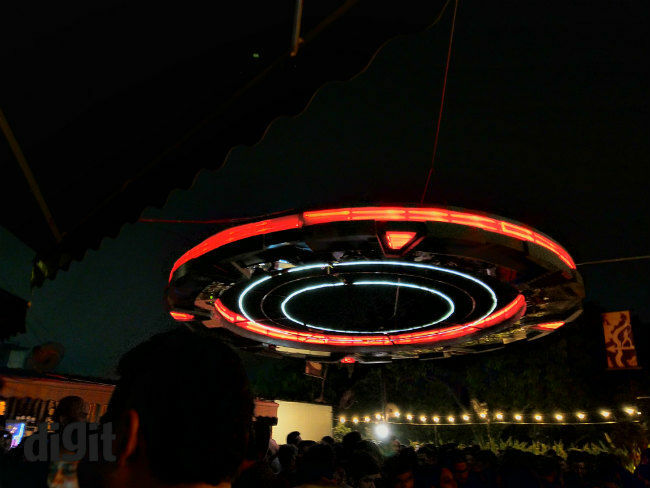 There’s also a cool tint to the photos which may not ring well with enthusiasts. The Nokia 7 Plus doesn’t skip on being a selfie-centric phone. On the front is a 16-megapixel Carl-Zeiss lens that takes some sharp selfies. What’s impressive is that the phone can preserve the background exposure without compromising on the highlights of the face. The Nokia 7 Plus can also take ‘bothies’ which is Nokia’s marketing speak for firing all the three cameras simultaneously to show both sides of the frame. Apart from this, you can livestream on Facebook and YouTube directly from the camera app which is going to be helpful for vloggers. For the most part, the camera at the back is surprisingly good. Just that it’s quite slow to process the photos. Thanks to a power-efficient chipset and stock Android, the Nokia 7 Plus can easily last over a day and then some. With a 3,800mAh battery, the phone has enough juice to power you through the day, no matter how intensively you use the device. I played PlayersUnknown Battlegrounds on the phone for an hour and the battery drop was an acceptable 40 percent. This can double up as a power user’s phone with ample amount of social media browsing, taking photos, listening to music and watching videos. On PCMark’s Work 2.0 battery test, the phone lasted 11 hours 33 minutes which should convert to one and a half days of battery life. That’s almost as same as the Redmi Note 5 Pro which has the best battery life in the mid-range segment so far. The Nokia 7 Plus also comes with Quick Charge 4.0 which can charge the device to its full capacity in around 90 minutes. Summing it all up, the Nokia 7 Plus is definitely a winner in its segment. It may be an expensive mid-ranger, but it is a good one. The phone scores well all round, in design, performance and battery life. The camera would have been perfect if not for the slow processing speed, but that’s an acceptable trade-off considering how well the phone performs otherwise. HMD might just fix it with a software update. The phone will be available exclusively on Amazon India, which means availability might be an issue. Nevertheless, the Nokia 7 Plus is the true comeback phone for Nokia and is at par with the competition, sometimes even giving the established players a run for their money.